With the rumoured Hayao Miyazaki to come out of retirement, lets have a look at what IGN’s top 10 Miyazaki movies to date are. The first feature film of Miyazaki’s career, Castle of Cagliostro puts the lecherous master thief Lupin III in a sticky situation where he mistakenly steals a load of counterfeit bills from a casino. Lupin, being the criminal genius he is, realizes that there’s more money in the plates that printed the fake bills. Lupin traces the money to the small country of Cagliostro, where he and his team of rouges battle ninjas (yes, ninjas), foil the plans of the local royalty and save a beautiful young lady in the quest to find the Cagliostro fortune. The movie has often been compared to a James Bond flick… if Bond happened to be a Japanese thief. 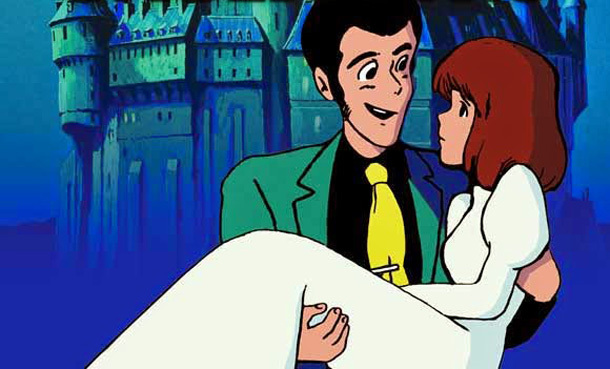 While this movie was pretty entertaining and certainly captured the essence of Lupin, the animation techniques of the time just weren’t good enough to convey the filmmaker’s vision. 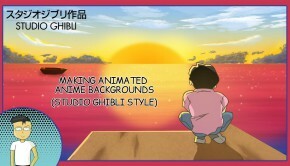 Fortunately, Miyazaki was just getting started. Including Whisper of the Heart on this list is a bit of a stretch — Miyazaki did not direct the film, but wrote it and was credited as storyboarder, producer, and sequence director. The story focuses on Shizuku Tsukishima, an insecure kid who loves reading books about fairytales. By chance she meets Seiji, a student in her class and fellow bookworm. Over time, Shizuku falls in love with Seiji, and his dream of becoming a violin craftsman inspires her to pursue her own dream of becoming a fantasy novelist. Shizuku begins writing a story based on the antics of a character she models after a strange cat figurine she sees in an antique shop. She names this character The Baron — the fantasy scenes were so well-received that Studio Ghibli released a movie based on them, The Cat Returns. 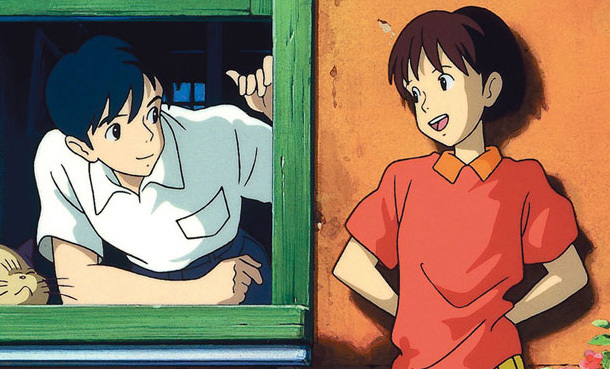 Whisper of the Heart explores the imagination of an adolescent, and the tenderness and warmth of budding young love. It’s one of Miyazaki’s most poignant stories, and one of the most masterfully told. Still, it’s not as immersive or epic as many later works. 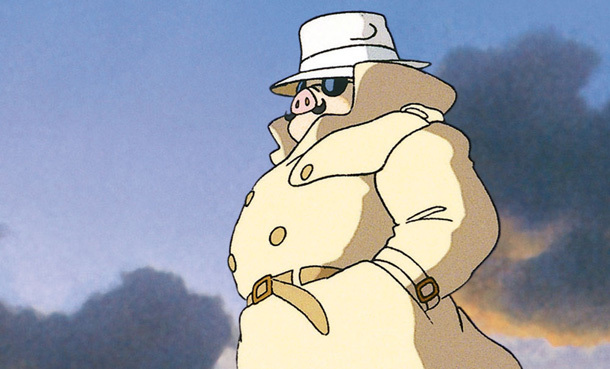 Porco Rosso is widely regarded as Miyazaki’s strangest movie. And if you’ve seen all of the director’s works, you’ll know that’s saying something! It’s a story that takes place in the early 1930s and follows the adventures of a dashing Italian pilot/bounty hunter that has, for some reason, been afflicted by a curse that gave him a pig’s head. Miyazaki is a big fan of old airplanes, and the film served as an avenue for him to focus on his hobby with plenty of aerial acrobatics and dogfights. Maybe he’s a fan of pigs, too? We don’t know. Porco Rosso was originally intended to be a short work to entertain Japanese businessmen during long flights (why not? 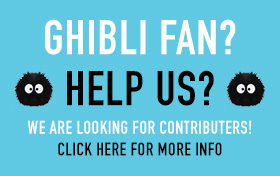 ), and even Miyazaki isn’t quite sure why it became popular among younger fans. Nominated for an Academy Award for Best Animated Feature, Howl’s Moving Castle is an epic tale that takes the viewer from an ordinary modern setting into a fantastical realm of witches, wizards, and war. It boasts excellent animation and a very creative story. The film centers on a hat shop girl named Sophie whose life is changed forever when she meets a handsome wizard, Howl, who saves her from a gang of thugs. Howl charms Sophie with his feats of magic and suave demeanor, but when the vengeful Witch of the Waste learns of their encounter she puts a spell on Sophie that turns her into an old woman. As Howl fights a war in his mystical realm, Sophie fights to lift the curse and regain her youth. The problem with Howl’s is that the story wasn’t originally from Miyazaki. Miyazaki adapted the work from a novel by Diana Wynne Jones. 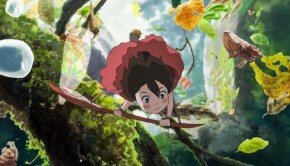 The film differs from the novel in a number of ways, and critics have argued that the process of Miyazaki merging his own views with the original story didn’t quite work. One of the earlier stories in the “steampunk” subgenre of fantasy fiction, Castle in the Sky (a.k.a. Laputa: Castle in the Sky) was Miyazaki’s third feature film. The 1986 movie was the first that prompted many to take note of Miyazaki’s skills as a storyteller. In the film, an orphan named Sheeta inherits a mysterious crystal that links her to the legendary kingdom in the clouds that is called, oddly enough, Laputa. Sheeta meets a resourceful and brave young man named Pazu, and together they make their way to the ruins of Laputa. But there are evil forces in the world that want to use the ancient yet advanced technology of Laputa to rule the world, and only Sheeta and Pazu stand in their way. 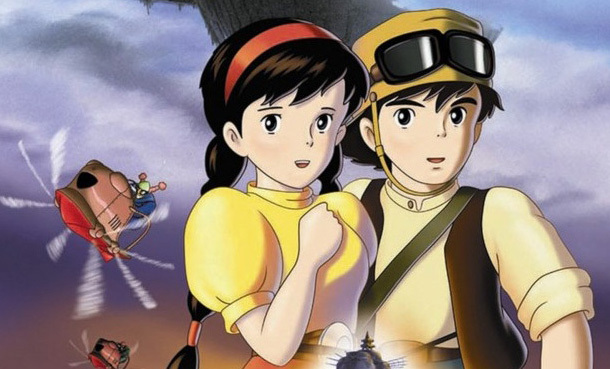 Castle in the Sky is an epic fantasy with a deep mythology and plenty of lavishly animated anime eye-candy. This 1989 movie tells the wonderful tale of Kiki, an ambitious young girl trying to become a full-fledged witch. With only her black cat Jiji by her side, Kiki flies to a city far away and sets up a delivery service. Their specialty? Delivery by broomstick, of course. 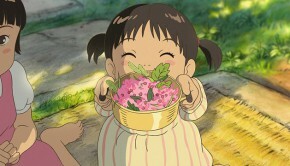 This film is one of Miyazaki’s family favorites, and is arguably his most popular with mainstream audiences. It’s a great character-driven story that expertly explores the theme of a young girl developing independence and confidence. 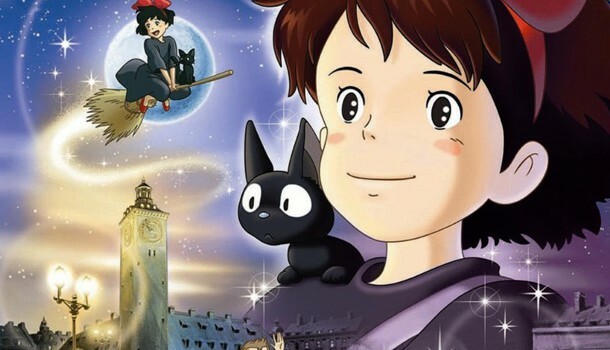 Core fans of Miyazaki may not view Kiki’s Delivery Service quite as highly as mainstream viewers, however, as it lacks the conflict, scale, and drama that mark many of the filmmaker’s other works. 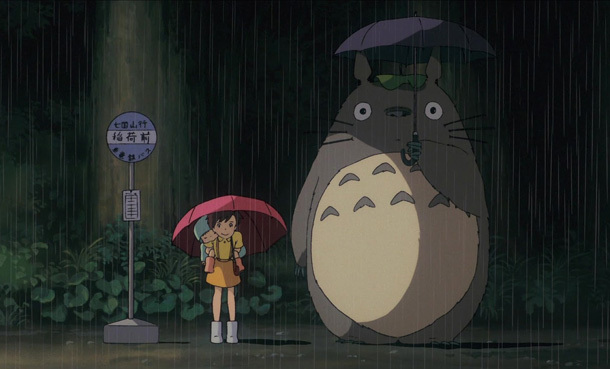 My Neighbor Totoro is Miyazaki’s trippiest film. It follows sisters Satsuki and Mei who befriend a strange forest spirit named King Totoro. Mei and her sister learn that it’s Totoro’s powers that make the trees grow and the winds blow. Totoro takes a liking to the girls and leads them on a series of wild adventures through the forests. Oh, that doesn’t sound trippy enough for you? Well, consider that Totoro is essentially a giant bunny rabbit. And then there’s the Catbus. Oh, yes — the Catbus. It’s a cat that turns into a bus and transports the girls over the countryside. Be warned: Watching this if you’re not entirely sober may cause brain damage. Though some of the Japanese cultural references in the film are lost on the American audience, the movie’s themes of familial bonds and courage in the face of difficult situations make it a perfect family film. 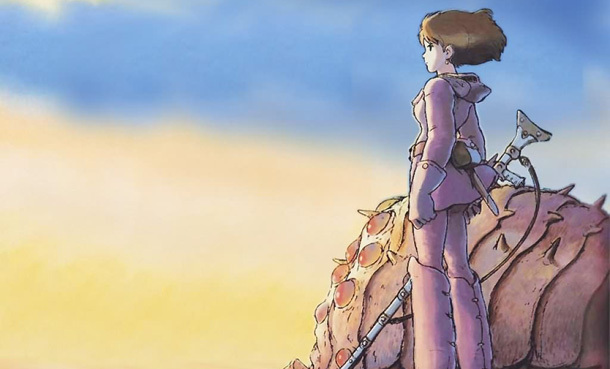 Nausicaa is Miyazaki’s second feature film and a sentimental favorite of many longtime anime fans. The movie’s top-notch animation and epic themes made it a cult favorite as the genre gained international recognition in the 1980s. The story takes place one thousand years after a near-apocalyptic war forces the last vestiges of mankind to struggle to exist on the fringes of a polluted forest inhabited by gigantic insects. Nausicaa, the princess of the Valley of the Wind, is one of the few people left that truly understands the environmental significance of the forest. Nausicaa is the film that brought about the creation of Studio Ghibli. It’s also notable for being totally bastardized in a North American version called Warriors of the Wind. 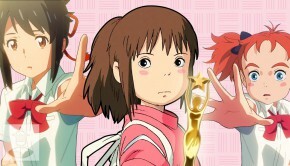 That cinematic farce prompted Miyazaki to adopt a strict “no edits” rule for future foreign releases. Phew. Spirited Away tells the story of a young girl named Chihiro, who follows her parents into what appears to be an abandoned amusement park. 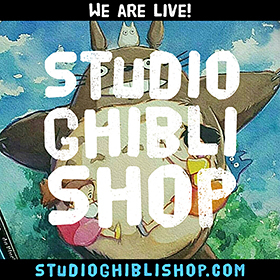 After her mother and father are turned into pigs, Chihiro gets a job at a bathhouse for spirits, and her adventure begins. 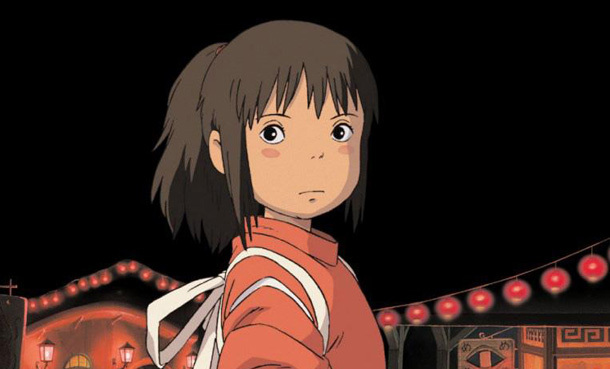 Spirited Away is an animated film that’s simply bursting at the seams with imagination. The designs of the various spirits that Chihiro encounters are some of the best things about the movie. This is Miyazaki at his best. It’s a very strange tale, with some very scary, almost frightening, antagonists. But Miyazaki’s favorite themes of environmental awareness, love, and bravery were never better displayed than in this film. Plus, it won an Oscar. Despite what the title might lead you to believe, the main character in this film is male — a rarity among Miyazaki protagonists. Young warrior prince Ashitaka is afflicted with a deadly curse. As he searches the forests of the west to find a cure that will save his life, Ashitaka finds himself in the middle of a battle between a group of rifle-toting ironworkers and the angry gods of the forest. Things get even more complicated when he meets the fiery Princess Mononoke, a young woman raised by wolves. 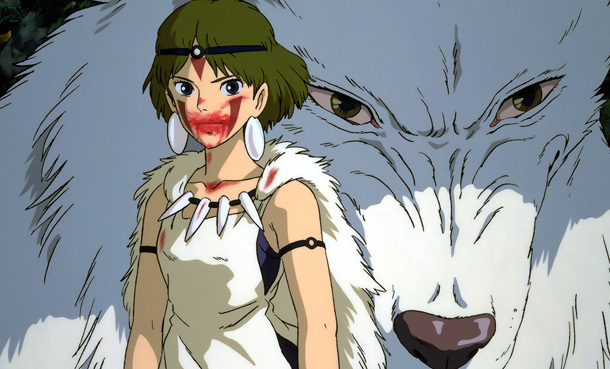 Billed as “the Star Wars of anime,” Mononoke’s epic adventure story creatively draws upon a wealth of established themes and archetypes from classic hero tales. The main theme, the beauty and sanctity of nature, is juxtaposed with rather violent and well-executed action scenes. The English dub of Mononoke was one of the first anime feature films to attract an all-star cast of American actors, including Gillian Anderson, Billy Bob Thornton, and Jada Pinkett-Smith.